It’s been over for a few months now, but IMAPS was a bit slow this year gathering the presentations from their device packaging conference, This is however understandable and excusable due to the untimely death of IMAPS employee Jackie Joyner. So let’s begin looking at the 2.5/3D and significant advanced packaging papers. Laura Mauer of SSEC discussed silicon wafer thinning to reveal Cu TSV. The standard via reveal processis shown below. SSEC contends that a KOH wet etch process can be used for the final Si removal without etching the oxide liner. This can be sealed with oxide/nitride and then CMP’ed to expose the Cu vias. 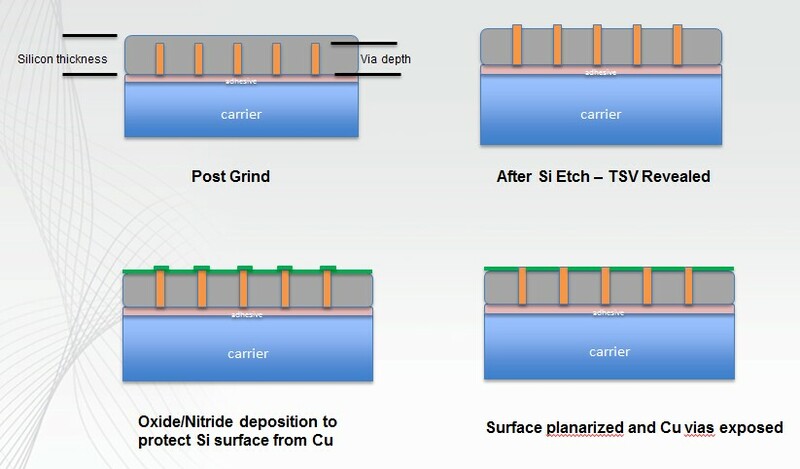 Wet etch with HF/HNO3 has also been proposed by ASET and shown to have minimal impact on the electrical characteristics of the transistors [link]. 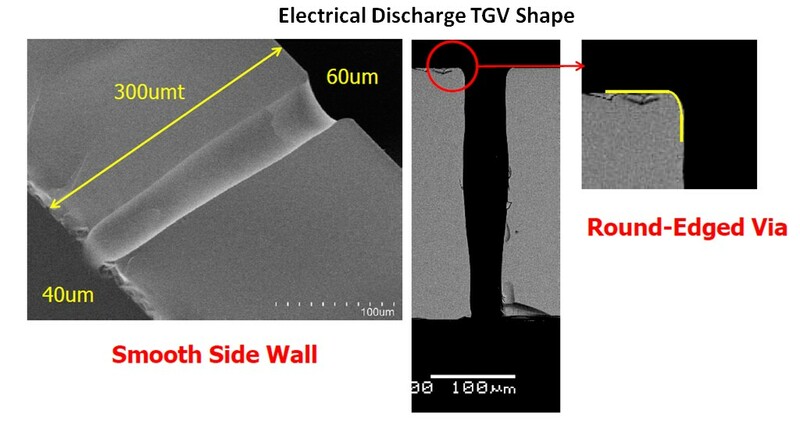 Focused electrical discharge can also be used to process TGV in less than 1 ms. AGC claims that there is no physical limit to TGV diameter using electrical discharge. Electrical discharge TGV show smooth sidewalls and rounded via edges. Similar to the laser process the process requires no masks. Hitachi Chemical discussed non cnductive pastes and films. Packaging in general is moving towards finer pitch and smaller gaps requiring a change in underfill materials and procedures. NCP and NCF applicable for fine pitch and narrow gaps. In terms of pad finish, Hitachi notes that Cu with OSP "is more difficult to have a good connection." Vacuum lamination is preferred and curing is done at 175C for 1 hr. Voiding seen after bonding can be eliminated by pressure curing or optimizing the film thickness. Initial reliability tests indicate good adhesion through MSL-3- 260 C and TCT cond B.
Fujitsu described further advances in their low temp Cu-Cu bonding technology [link]. 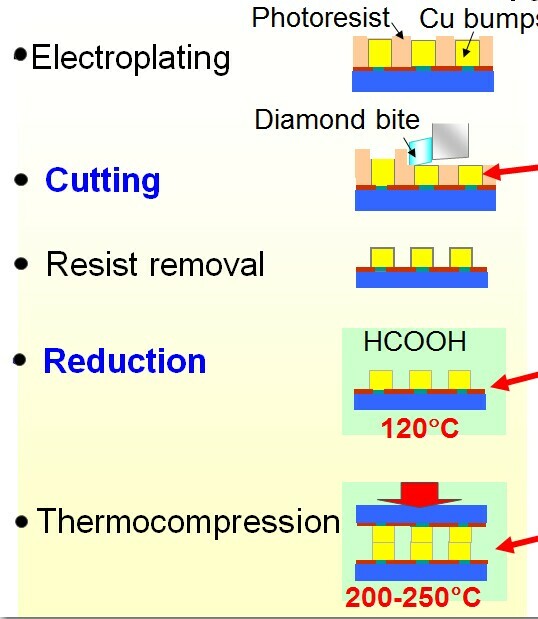 Their unique process uses a diamond bit milling machine to achieve a highly uniform and highly polished (7 nm surface vs 210 as plated) which can be thermo-compression bonded at RT and shows grain growth across the interface at 200 - 250C vs 350 C+ for a standard CMP’ed surface. 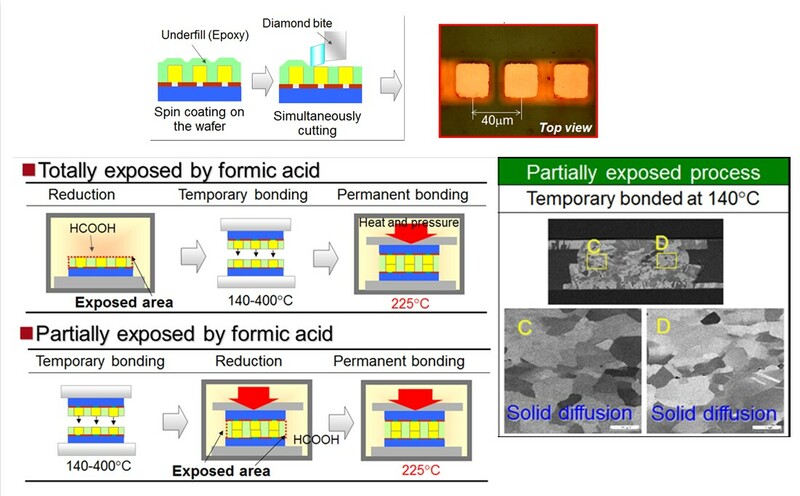 Underfill and Cu bumps can be simultaneously cut together by diamond bit with no residue on bump, but hybrid copper/underfill interface exposed to formic acid before bonding "could not sustain arranged location during bonding process." However, if the interface is bonded first and then exposed to formic acid, "partially exposed," clearly grain growth occurs as low as 140 C.
For all the latest on 2.5/3D IC and advanced packaging stay linked to IFTLE…………………….